Toyota’s Hiace van wouldn’t be high on our list of the best vehicles to modify, but the world’s car tuners do seem to make odd choices sometimes. In Europe the Volkswagen Beetle and Transporter are perhaps the most inappropriate, whilst the Japanese modifying scene has gone a similarly daft route with ‘Bosozoku’ – the style in which builder filsawgood has created his splendidly ridiculous Toyota Hiace drift van. Underneath the be-stickered Technic bodywork is a Technic buggy motor powering the rear wheels and a Power Functions servo motor which steers the fronts. These are linked to the previously featured third-party SBrick which enables control via a tablet or other mobile device. 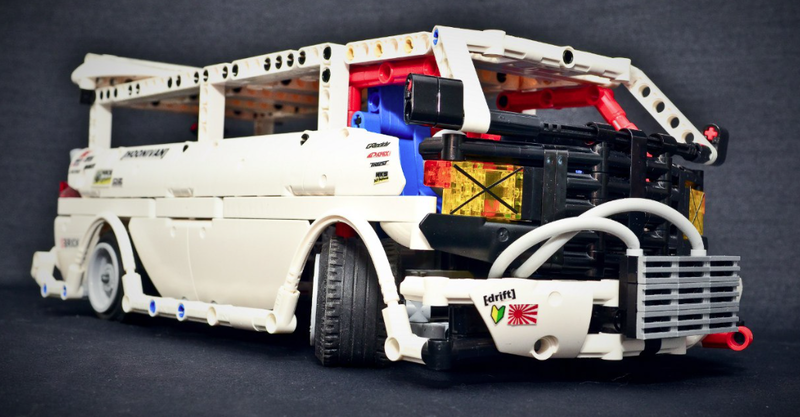 For more details on the Hiace Hoonivan and to see a full gallery of images head over to Eurobricks via the link above.